So the three months I’ve had to prepare my portfolio submission for the Visual/Fine Arts program I’m hoping to be accepted in to, has flown by. Where, oh where does time go while we’re avoiding things? This weekend I’m finishing off a water colour and packaging up the terrifyingly amateur looking pieces of my portfolio for scrutiny on Tuesday. I’m fighting conflicting feelings of hope and preparing for rejection. It reminds me a bit of being in high school and that horrible practice of peer team picking in P.E. – the one where I often found myself the last girl standing. Shudder. Hopefully this will turn out better. One of the portfolio submission requirements for the Visual/Fine Arts program is a review of a current novel or movie from a personal opinion perspective. 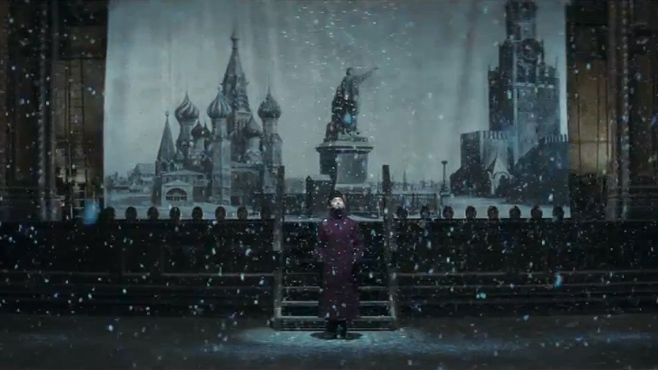 I chose Anna Karenina, the movie adaptation of Tolstoy’s Russian period novel. So here’s my not very Siskel and Ebert attempt at film critique. 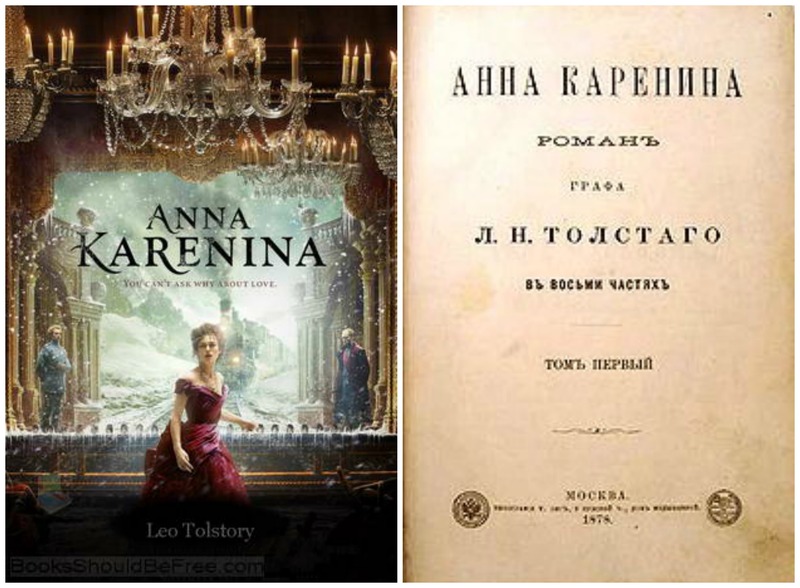 It was with some anticipation I waited for the November 2012 release of Leo Tolstoy’s, Anna Karenina. A few months earlier, a small group of us had begun reading the novel, declared by Time magazine to be, ‘the greatest novel ever written’, intending to see the movie together once we were done. At our visit to the local bookstore, I was taken with Kiera Knightly’s romantically gowned figure, set against a theatre back drop on the front cover of new movie edition paperback. Far be it from me to not judge a book by its cover. I wasn’t sure what to expect from the story at all, but just reciting to myself that I was reading ‘Tolstoy’ made me feel a little deeper than usual – connected to the mysterious, substantial, classical literary world. Anna Karenina was originally published in serial installments in the periodical, The Russian Messenger between 1873-1877. Fyodor Dostoevsky, another name I like to roll off my tongue, declared it to be “flawless as a work of art”. Oh my, what to expect after such an introduction? Would I agree, I wondered, with the view of the literary and philosophical figure? The story is set against the troubled political, social and spiritual atmosphere of 19th-century Russia. It was considered a pinnacle of ‘realist fiction’, exploring themes of hypocrisy, jealousy, faith, fidelity, family, marriage, society, progress, carnal desire and passion. With all that to cover, it’s no wonder the book spanned eight parts and nine hundred and sixty three pages. I appreciated Tolstoy’s honest and expansive exploration of human nature through his characters, but admit I found myself a bit bogged in psychological detail. And the tragic tale of Anna, Alexei and Count Vronsky’s ill-fated love triangle; maybe I’m a little too seasoned for such things. I find train wrecks, literal or figurative, imploding lives and suicides, disturbing. There’s enough of that in real life without having my entertainment clouded with it as well. But I suppose that’s the object of realist fiction, isn’t it? Levin and Kitty on the other hand, while they lacked the charisma of the Anna, Alexei and Vronsky, certainly had the best chance at happiness. If they were real, of course. I have a pet speculative psychological theory about the main characters. That Count Vronsky was narcissistic, that Alexei Karenin suffered passive aggressive disorder, and that Anna was the classic victim. Poor Anna, an emotionally immature girl married at 18 under Russian societal pressure. When she came face to face with her discontent and boredom years later, she looked for happiness in a man entirely unable to love her. And thus suffered the loss of herself, her position, her child and ultimately, her life. Such are the perils of falling for a narcissist. Poor Anna might have met a different end with the benefit of a good therapist. As it turned out, our Anna Karenina book club/movie night didn’t go off out as planned. I watched it instead on Netflix with my teenage daughter, munching popcorn on the basement couch. The movie hit Netflix much sooner than I expected, likely not making out as well in theatres as predicted. I imagine something critical was lost not seeing Anna on the big screen. I’m not sure it would have changed my overall view, but it may have stopped me from falling asleep. 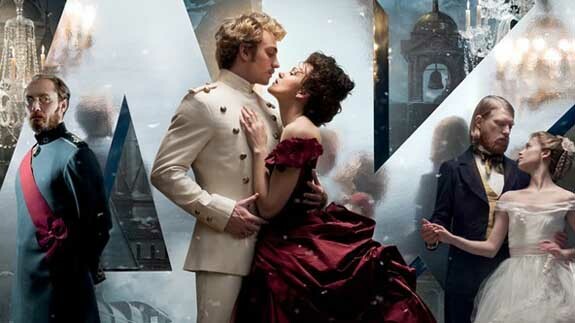 ‘Visually Stylized’ is the word I think best describes John Wight and Tom Stoppard’s adaptation of the novel. It had, in my opinion, the makings of an epic romantic drama, like Gone with the Wind, but fell short. I was confused and distracted by the theatre-like staging. Though it was a novel concept, it detracted from my ability to follow the already complex plot. I’d been looking forward to being transported to 19th century St. Petersburg in all its golden grandeur. But instead found myself backstage theatre, amidst the ropes, pulleys and curtains, feeling vaguely unsatisfied. I was however, completely and utterly enchanted with the costume design. 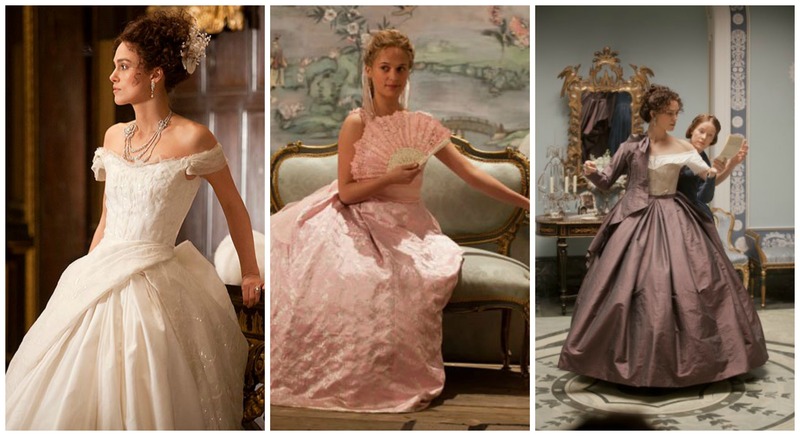 And apparently I wasn’t the only one, Anna Karenina took home the 15th Annual Costume Designers Guild Award for Excellence in Period Film, an Oscar for Achievement in Costume Design and a BAFTA award for the same. They say that no two people ever read the same novel because we see things not as they are, but as we are. Though I had mixed feelings about both the book and movie, an acquaintance gave the movie a rave review – connecting intimately with Anna’s complicated plight and ultimate death. As it turned out, a parallel scenario, a love triangle was playing out in her own life. One which made the movie all the more poignant for her and validated the story as realist fiction. That all being said, I’m likely to watch the movie again to rethink its visual artistry. The book however, has been abandoned unfinished on my bookshelf. My apologies to both Tolstoy and Dostoevsky. I’m afraid I’ve discovered I prefer rose-coloured glasses to realism.